As I mentioned in my last post, I have been feeling a bit disconnected from reading and blogging lately. I thought a good way to change things up a bit was to go back and reread some favourite books. I am also rereading Outlander by Diana Gabaldon. This might be the year I read beyond book two in the series! This also might be the year I finally read Her Fearful Symmetry by Niffenegger. 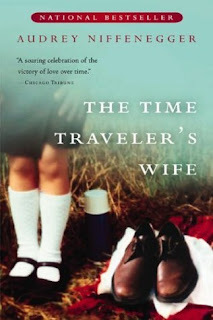 Anyway, I think this is my third time reading The Time Traveler's Wife. I read it when it was brand new, so before blogging, and then reread it in 2009. I want to say I have reread it another time, too, but now I am not so sure. When I read this book for the first time it was complete whim. I was browsing the bookshelves at the store and my eyes fell on this book. At the time I hadn't really heard anything about it, but I liked science-fiction and decided to give it a try. When I finished I was so excited and lent it to a bunch of my friends. They gave it back and told me they didn't get why I loved it so much. That book has been lent out more than any of my other books, but I don't think anyway I have lent it to has enjoyed the book quite as much as me. That made me sad and was one of the reasons why I was so happy when the book started to get a lot of attention and then I met blogging friends that also loved the book. This is the main reason I stick with blogging even when I get a bit dispirited. This book was enjoyable with another read through. I still love it and look forward to reading it again in the future. I find with the book that I fly through the first part, but since I know how the book ends I tend to read a bit slower. The whole book is good, though. It is just a sad book for a while there. When I read it the first time it was all a surprise. When I read it now, though, I know the story pretty well. I forget some of the details, though, so it still reads well with every reread. I still am baffled with my love affair with this book. I was drawn to it in the first place because of the science-fiction aspect, but this is also a romance novel at the same time. I am surprised that aspect of the story didn't turn me off every time I read it, but it all works together to make an enjoyable read. I won't rehash the story because it has been reviewed forever, but I will say that I love this book and think everyone that STILL hasn't read it, should read it! Every once in awhile I come across a post or comment of someone who didn't like this book and I find myself doing the flabbergasted mouth dropping open "say what?" face. I read this book after my wife and several of her library friends insisted that I should read it and several bloggers were praising it too. I realize we all like different things, but this is one of those books, along with Diane Setterfields' The Thirteenth Tale, that I feel really sad about when someone doesn't get what all the fuss is about. Such a wonderful book. I cried throughout the entirety of the last 50 or so pages of the book. I love Henry and Clare and this is a book I really should revisit myself. I raved about it in my initial review back in '05 and I also listed it as one of my Top 20 in the 2000's novels. I have avoided seeing the film because I just know it cannot do the book justice. I may break down and see it some day, but I am not going to seek it out. Glad you decided to visit this old friend and I hope it helped kick the funk out, at least a little bit. I'm with Carl on this one. I've read and re-read this one and still love it. My best friend just wasn't a fan. yoiks, I've never read this, though I've heard about it of course, and now I feel I really must add it to my list! this is one of those SF books that I can't believe I haven't read yet. I did see the movie earlier this year, and although I'm sure the film doesn't do the book justice, I felt it was a pretty good movie and very well done. Forget library for this one, i think this is something i need to buy! My 19 year-old son just read this one and loved it!! It's funny how you've re-reading lately to restart those engines...I just read Harry Potter 1 and 2 today!!! I loved this book. It sits on my shelf with no plans of ever leaving it. Funny though, I never thought about re-reading it. Now, I think it would be a fantastic re-read and maybe I will this year. Outlander is my favorite series, and I have read Outlander three times. I am currently re-reading Voyager, and oh my...sigh...what a great re-read. I know the story, but the details escape or new ones show their face. **Melissa: It is such a great book! **Charlotte: You have to read it!!! **Redhead: It's a great book! !